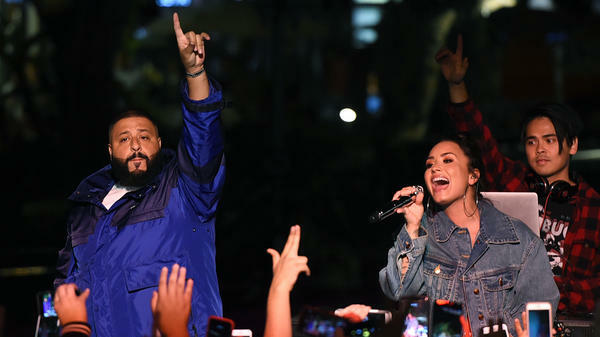 Demi Lovato and DJ Khaled appear at The Grove in Los Angeles in Nov. 2017. Now that film — which is getting decidedly middling reviews — and soundtrack are both out today, here are the tracks that caught the ears of NPR Music. Kehlani's become somewhat of a commodity for big-budget soundtracks since her breakthrough project, 2015's You Should Be Here -- the Oakland R&B singer has appeared on three of them in the past two years (Fate of the Furious, Everything, Everything and Suicide Squad). For Ava DuVernay's ambitious, defiantly heartfelt A Wrinkle In Time, Kehlani is tapped yet again, this time for "Let Me Live." It's a trop-pop R&B ballad with steel drums, reverb'd toms and a simple, insistent guitar chord all swaying at once to Kehlani's singular beat. The lyrics are stadium-anthem poetics, universal and vague enough to be felt by everyone... and believed by no one. "Afraid to be strong, and too strong to be afraid / Caught up in the days between staying and running away," she sings. Tenacious-to-a-fault powerhouse singer Demi Lovato and Snapchat dynamo/positive lifestyle guru DJ Khaled are a no-brainer pairing to deliver an inspirational mid-tempo power ballad. In "I Believe," Demi preaches clear-eyed optimism with her jagged-edged voice on simplistic chorus: "Today I saw a rainbow in the rain / It told me I can do anything / If I believe in me." As Parkwood Entertainment/Columbia Records darlings, sister act Chloe x Halle serve as the youngest featured artists on the film's curated soundtrack. Their honey-hued harmonies melt into one another on "Warrior," an ode to bright-eyed independence, produced by Chloe Bailey. "I could be a warrior, yes I am a warrior / There's no need to worry, love / Look around it's glorious / Close your eyes and taste the sun," they melodically preen on the song' chorus. DuVernay teased Sia's "Magic" on Twitter last week, writing that the song was "written just for Meg as [she] uses her inner light to search for her father on faraway planets." Like Sia's 2016 album This Is Acting, "Magic" builds on her signature smiling-through-the-tears brand of hopeful pop [Ed. note: Are you noticing a theme?] about recovery, with a decidedly even-happier attitude. The song's piano intro floats in on minor chords, as the lyrics express a childlike fear: "Now I don't wanna float to light / On a cloud of man-made ice," she sings with a magical realism that recalls A Wrinkle In Time author Madeline L'Engle's surreal prose. "Saddle up now for the ride / Waiting for the moon to rise / Don't want life to pass me by."